Currently, 48 miles of the Mon River / Caperton / Deckers Creek Rail-Trails are open for non-motorized use, primarily walking, cycling, jogging, and cross-country skiing with a smooth, durable surface for wheel-chair use and all types of bicycles. In Morgantown and Star City, eight miles of trail are paved, allowing for in-line skating. The rail-trail connects three counties, Marion, Monongalia, and Preston Counties in North Central West Virginia. The Rails-Trails are fun in all seasons. 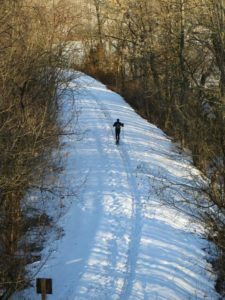 We do not plow the rail-trail in the winter but it still gets lots of use. The Caperton Trail has an urban feel with neighboring city parks, restaurants, and shops. The relatively flat Mon River Trail meanders along the wooded river valley with occasional bottomland and field habitats. The Deckers Creek Trail is more of a challenge as it climbs at approximately a 2% grade 1,000 feet over 19 miles with rhododendron and hemlock groves, deciduous forests, into more open fields and farmlands in Preston County.